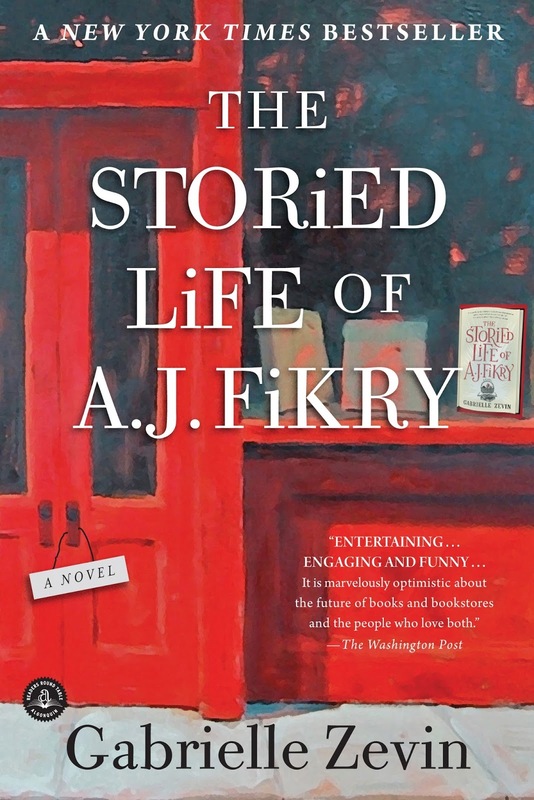 Late last summer I saw a copy of The Storied Life of A. J. Fikry on a bookstore's book shelf. It immediately captured my attention and a quick perusal of the back cover description made me even more interested. "A.J. Fikry's life is not at all what he expected it to be. His wife has died, his bookstore is experiencing the worst sales in its history, and now his prized possession, a rare collection of Poe poems, has been stolen." "And then a mysterious package appears at the bookstore. It's a small package, though large in weight - an unexpected arrival that gives A.J. the opportunity to make his life over, the ability to see everything more." 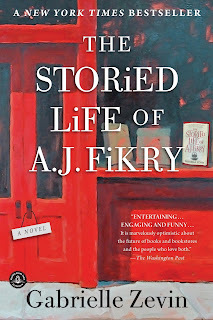 The Storied Life of A. J. Fikry showed up under the Christmas tree this year (as I had put it on my wish list) and I eagerly dove into it the day after. I wasn't in more than three chapters when I knew I wanted to finish the book up quickly so that I could tuck it behind me in my "read in 2015" pile instead of carrying it with me, unread, into the new year. This is to say that I hated the book, but also found it compelling enough a storyline to read until the bitter end. A.J. Fikry is a dismal character. Some would say he's a very realistic one and easy to identify with. His life has proved to have its fair share of difficulties. He is a widower who owns a fledgling bookshop and drinks himself unconscious far too often. Hope is non-existent in his world which makes his tale more depressing to me than anything else. His bleak looking future improves a bit once a small child is found abandoned in his bookshop. There is a note attached to the child indicating that the mother wishes her daughter raised in the care of A.J. Fikry. He ends up adopting her and their story continues together. I don't want to spoil everything about the book so I'll leave it at that. I think the back of the book gives that much away, but not much else. Now, my husband and I have adopted children and so you might be asking yourself why it is that I'm not much a fan of this particular adoption story. Well, for one, it's not very realistic. At all. It's a magical matching which is very outside the norm, so my breathe isn't likely to be taken away just because there is an adoption theme to this book. If anything, I found it slightly eye-rolling. Chiefly though, I did not enjoy this story because I didn't like any of the characters. They are rather a hard and crusty bunch who all have mouths like sailors. If you are at all prone to be bothered by foul language in books, you will not want to step anywhere near this book by Gabrielle Zevin. You'd need multiple bars of soap to clean out these potty mouths. I'm of the mindset that you don't need foul language to tell a good story. Not seeing the reason to include it, I would steer clear of avoiding this story for this reason alone. 1. Zevin is a good story teller. The way she weaves the different character's back stories together is appealing. Also, her writing style is unique. I've never come across a book written in this style and I found it to be curious. 2. I knew Zevin was writing without care for a reader's wishes. I did not know where her story was headed but I knew she was in command of it. I could tell that Zevin wrote for pleasure, from imagination, and with a plan in mind. When someone writes or speaks with this degree of confidence, I'm forced to take notice. I can't look away because they want me to understand something and/or accept something. She asked me to listen and I consented whether I agreed with her ideas or not. As it is, I didn't like her characters or how the story ended up. I wouldn't seek out another Zevin title mostly for the language issue. My only goal, as I said above, was to leave the read behind me in 2015. Mission accomplished. This book took me outside of my comfort zone and made me curious in a way that most modern authors fail to do. Some will say that I shouldn't have read it and others will say that its great that I did. For my own part I'll say that I read it, but I wouldn't recommend it. That's the best summary I can give. That was a great summary. This was one of the new fiction books that I read last year - assured that anyone who loves books will love this story. And I disliked it for the same reasons as you did. It was just "ick", but I needed to see the characters to their conclusion, I think, because the situations were so bizarre I didn't know how they would wrap up. I started this book and then set it aside. I don't remember overly liking it, but after reading your thoughts about the profanity, maybe that was why I stopped reading. My mind is failing me here, but either way, you have convinced me to leave it closed. I really was fascinated with the book as soon as you introduced it by sharing the back cover summary... it was like any bookworm's dream book! But it quickly went downhill from there. :( It's too bad that authors have to resort to foul language to bring out emotion in characters -- I loathe books where that is done. Too bad, indeed. Oh well. I'll just enjoy the 1000+ other books I'd rather be reading -- lol! I am assuming the finding of the little girl affected Fikry for the better in some way. Maybe not. :-) Though your first few paragraphs make the book sound interesting, this doesn't sound like a book I'd enjoy at all, both because of the language and the dismalness. Sounds disappointing after a fabulous teaser. I'm curious. This was a gift, but you didn't love (like) it. Do you keep it, sell it, or donate it? Alas. I'm sorry you didn't like it. I definitely have a higher tolerance for language than you do (I skim over it, even though I don't appreciate it, it doesn't totally ruin the book for me). I enjoyed all the book-i-ness (and references to other books!) and found it a quick, easy little escape. @Shonya - I can see that. @Annette - Sell it. Or rather, in my case, take it to my local used bookstore and trade it in for store credit. The language is something I skip over, but I just found the whole book to be a bizarre story. It is not one I would recommend. You did a nice job with your summary. This book came very highly recommended to my book club and is on our list for 2016. A couple of our members have already read it and loved it. They are very excited about discussing it. But for me, after reading your review, not so much! We had a book in 2015 with unlikable characters and a liberal dose of profanity that I ended up not finishing. It was, of course, a best seller and came highly recommended. I had high hopes for this book. Oh well, it is already on the Kindle (purchased with Christmas gift cards) and I will endeavor to read it. Not sure if it will end up in the DNF pile! I couldn't figure out why the author's name seemed so familiar, and then I realized I've read her before. One of my first blog posts was a review of her Memoirs of a Teenage Amnesiac, and I intensely disliked it. Thin story, unlikable characters, and foul language. Starting to think this may be an author to avoid.